This Monday, Israel launched a series of attacks on Syria, sending jets to assault key Syrian military bases. 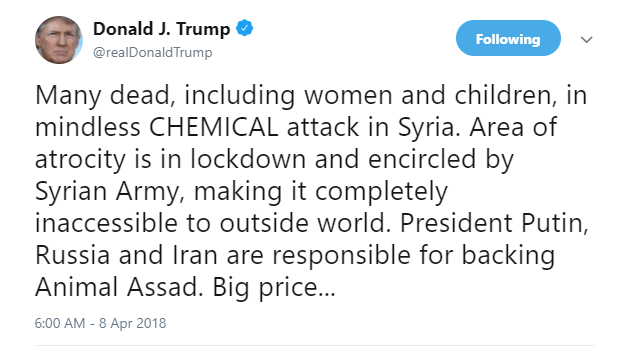 While the USA was not involved in the attacks, this time round, it is clear Israel has felt vindicated by President Trump’s aggressive rhetoric towards Syria only a day earlier on Twitter, where he chastised Putin and Iran for supporting “Animal Assad” and his alleged chemical attack. With reports confirming Israel notified USA on their upcoming attack, it demonstrates the two countries are working in tandem. The idea of chemical attacks is naturally horrific. As a result, such accusations must be taken seriously. They must be accompanied with a wealth of evidence and be almost irrefutable. That has not occurred in this situation. We have been bombarded with a series of chilling photos and videos purporting to be the victims of the chemical attack. Such photos seem to be the extent of the evidence we have been given. While these photos are shocking, the foreign policy of sovereign nations should not be decided purely on sad or moving pictures. That would be extremely irresponsible. General James Mattis, currently serving as Secretary of Defence in President Trump’s cabinet, has repeatedly admitted there is no tangible evidence that the “Syrian government has used the deadly chemical sarin on its citizens.” That is quite a confusing statement to make, two months prior to Trump using Assad’s chemical attack as justification for military force against him. Need we be reminded of the pretext for the Iraq war only 15 years earlier, where the false threat of ‘Weapons of Mass Destruction’ was constantly propagated by Blair, Bush and other government officials. How did that turn out? The Iraq War was a mess that lasted eight years and ended in thousands of lives being lost in vain. We must also question the supposed motives of Assad, a man who is in the middle of a bloody civil war. Why would he unleash a devastating chemical attack on his own people at such a late stage of the war, he is winning overwhelmingly? ISIS has been all but obliterated, leaving a collection of various rebel groups vying for power and occupying small pockets of Syrian soil. Moreover, President Trump announced his intention to recall US troops from the country only four days before the supposed ‘chemical’ attack. It seems everything was in Assad’s favour, so why on earth would he stage a chemical attack on his own people, knowing it would draw outrage, condemnation and almost certain military action from the international community? Unless Assad has a masochistic tendency or an unknown death wish, this supposed decision seems incredible, unlikely and downright suspicious. It is merely common sense to exercise some scepticism towards this narrative. Were we to entertain the narrative, that Assad did indeed orchestrate the chemical attack, then it raises further issues, that would discourage military response. Much of the world is fraught with danger, brutality and terror. If every example of grave injustice was used as justification for all-out war, then we would be invading almost every country on earth. The USA especially seems to have selective outrage. For instance, Saudi Arabia conducts routine bombings on Yemen, with thousands of innocent Yemeni civilians injured or dead as a consequence. Why is the US Ambassador to the UN, Nikki Haley not condemning this act of violence on civilians and demanding military force against Saudi Arabia? Perhaps it is due to America’s fondness of oil. Regardless, the decision to take military action against another sovereign nation is a serious one and it is one Theresa May must take soon, owing to US pressure. I simply hope she applies common sense befitting the office of Prime Minister. Great article, good to see at least someone has their head on their shoulders!